1836: born in Edo. His father Maruya Isaburô manages a restaurant in the district of Ashi-chô. 1839: he is adopted by Ichikawa Kuzô II, who gives him the name of Ichikawa Ginzô I. 11th lunar month of 1840: Ichikawa Ginzô I takes the name of Ichikawa Momotarô II. 1843: Momotarô achieves a great success at Kawarasakiza, sharing the stage with the young star Ichikawa Danjûrô VIII. 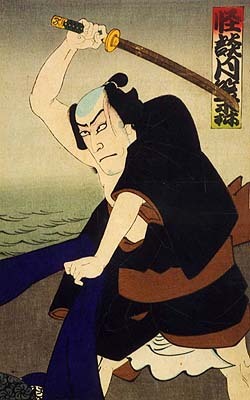 1844: Momotarô becomes disciple of Ichikawa Ebizô V and follows him to perform in Ôsaka. 11th lunar month of 1847: Ichikawa Momotarô II takes the name of Ichikawa Hakuzô II. 10th lunar month of 1852: Hakuzô follows his adoptive father in Ôsaka for his shûmei at the Kado no Shibai. 8th lunar month of 1854: Ichikawa Hakuzô II takes the name of Ichikawa Kuzô III at the Naka no Shibai (Ôsaka) by playing in the drama "Jiraiya". 5th lunar month of 1859: Kuzô plays the role of Issun Tokubê in the drama "Zôho Natsu Matsuri Otoko Kagami", which is staged at the Moritaza. His stage partners in the roles of Danshichi Kurobê, Tsuribune Sabu and Otatsu are Nakamura Fukusuke I, Ichikawa Danzô VI and Arashi Hinasuke VI. 1st lunar month of 1860: the 1762 puppet drama "Kishi no Himematsu Kutsuwa Kagami" (commonly called "Kishi Hime") is adapted for the first time to Kabuki, in Edo at the Moritaza; it is integrated within the new year sogamono "Momo Chidori Nigiwai Soga" and Kuzô plays the role of Iihara Hayatonosuke [casting]. 8th lunar month of 1861: premiere at the Moritaza of Kawatake Shinshichi II's drama "Sakura Sôshi Gonichi no Bundan", a revised version of Segawa Jokô III's drama "Higashiyama Sakura Sôshi"; Kuzô plays the roles of Orikoshi Masatomo and Ogata Nagatonosuke [casting]. 10th lunar month of 1861: premiere at the Moritaza of Segawa Jokô III's drama "Zôho Futatsu Domoe"; Kuzô plays the role of Saeda Inukiyo [casting]. 4th lunar month of 1864: premiere at the Moritaza of Kawatake Shinshichi II's drama "Wakaba no Ume Ukina no Yokogushi", commonly called "Kirare Otomi" ("Scarface Otomi"); Kuzô plays the role of Kômori Yasu [casting]. August 1879: Kuzô takes part in the opening ceremony of the Hisamatsuza [more details]. March 1884: premiere at the Harukiza of Takeshiba Kinsaku I's drama "Chûjô Hime Taima Engi"; Kuzô plays the role of the evil lady Teruhi-no-Mae [casting]. March 1886: première at the Chitoseza of Kawatake Mokuami's drama "Mekura Nagaya Ume-ga-Kagatobi" in which Kuzô plays the roles of Matsuzô and Kaisuke [casting]. November 1887: Kuzô takes part in the opening ceremony of the Azumaza [more details]. January 1888: Kuzô plays at the Azumaza the role of Sasaki Moritsuna in the drama "Ômi Genji Senjin Yakata". 1888: quarrel with Ichikawa Danjûrô IX. 1895: reconciliation with Ichikawa Danjûrô IX. June 1897: Ichikawa Kuzô III takes the name of Ichikawa Danzô VII at the Meijiza, playing several roles in the Kabuki program "Yumiharizuki Genke no Kaburaya", including the eponymous role of the short bombastic play "Kagekiyo", the villain Matsunaga Daizen in "Gion Sairei Shinkôki" and Ichisuke in "Kaidan Tsuki no Kasamori". August 1897: tour in Kanazawa. Danzô plays the roles of Tokaiya Ginpei, Taira no Tomomori and Igami no Gonta in the classic "Yoshitsune Senbon Zakura", which is staged at the Inariza. His stage partners are Nakamura Kangorô and Nakamura Tomijûrô III. May 1898: Danzô plays at the Ôsaka Kabukiza the roles of Tokaiya Ginpei, Taira no Tomomori and Igami no Gonta in the classic "Yoshitsune Senbon Zakura". July 1899: Danzô is the head of a Kabuki troupe touring in Kanazawa. January 1900: Danzô plays at the Harukiza the role of the villain Nikki Danjô in the drama "Meiboku Sendai Hagi". The roles of Hosokawa Katsumoto and Arajishi Otokonosuke are played by Ichikawa Ennosuke I and Ichimura Kakitsu VI. February 1900: Danzô plays the role of Tôma Saburôemon in the revenge drama "Tengajaya-mura", which is staged at the Engiza (Tôkyô); his stage partners are Nakamura Shikaku (Iori), Sawamura Tosshi VII (Motoemon, Kôemon) and Seki Hanasuke II (Genjirô). January 1901: Danzô plays at the Kumoiza (Yokohama) the roles of Tokaiya Ginpei and Taira no Tomomori in the "Tokaiya" and "Daimotsu no Ura" scenes of the classic "Yoshitsune Senbon Zakura". The role of Suke-no-Tsubone is played by Iwai Matsunosuke IV. October 1901: Danzô plays at the Naniwaza (Ôsaka) the roles of the villain Kô no Moronô and the hero Ôboshi Yuranosuke in the drama "Kanadehon Chûshingura". The role of En'ya Hangan is played by Arashi Kitsusaburô IV. December 1901: Danzô plays at the Kabukiza (Kyôto) the roles of the villain Kô no Moronô and Teraoka Heiemon in the drama "Kanadehon Chûshingura". February 1902: Danzô plays at the Naniwaza (Ôsaka) the role of the villain Nikki Danjô in the drama "Meiboku Sendai Hagi". The role of Hosokawa Katsumoto is played by Ichikawa Udanji I.
September 1902: Danzô plays at the Meijiza (Kyôto) the role of the villain Nikki Danjô in the drama "Meiboku Sendai Hagi". The role of Hosokawa Katsumoto is played by Arashi Ganshô. April 1903: Danzô plays at the Kabukiza (Kyôto) the role of Yosaburô in the drama "Yowa Nasake Ukina no Yokogushi". The roles of Otomi and Kômori Yasu are played by Nakamura Kaoru and Jitsukawa Enjirô I.
November 1903: Danzô plays at the Bentenza (Ôsaka) the role of Sasaki Moritsuna in the drama "Ômi Genji Senjin Yakata". December 1903: Danzô plays at the Meijiza (Kyôto) the role of Sasaki Moritsuna in the drama "Ômi Genji Senjin Yakata". November 1904: Danzô plays at the Meijiza (Kyôto) the roles of Tokaiya Ginpei and Taira no Tomomori in the "Tokaiya" and "Daimotsu no Ura" scenes of the classic "Yoshitsune Senbon Zakura". The roles of Suke-no-Tsubone and Yoshitsune are played by Arashi Ganshô and Nakamura Shibajaku IV. November 1906: Danzô plays at the Bentenza (Ôsaka) the roles of Tokaiya Ginpei, Taira no Tomomori and Igami no Gonta in the classic "Yoshitsune Senbon Zakura". September 1907: Danzô plays at the Bentenza (Ôsaka) the role of the villain Nikki Danjô in the drama "Meiboku Sendai Hagi". The role of Hosokawa Katsumoto is played by Arashi Kitsusaburô IV. November 1907: Danzô plays at the Nakaza (Ôsaka) the role of Kômori Yasu in the drama "Yowa Nasake Ukina no Yokogushi". The roles of Yosaburô and Otomi are played by Arashi Tokusaburô V and Nakamura Naritarô I. March 1908: Danzô achieves a great success at the Kabukiza by playing the role of the villain Nikki Danjô in the drama "Meiboku Sendai Hagi"; the roles of Hosokawa Katsumoto and Arajishi Otokonosuke are played by Ichimura Uzaemon XV and Matsumoto Komazô VIII. May 1908: Danzô plays at the Kabukiza the roles of Tokaiya Ginpei and Taira no Tomomori in the "Tokaiya" and "Daimotsu no Ura" scenes of the classic "Yoshitsune Senbon Zakura". The roles of Suke-no-Tsubone and Yoshitsune are played by Nakamura Shikan V and Matsumoto Komazô VIII. June 1908: Danzô plays at the Kirakuza (Yokohama) the role of Igami no Gonta in the "Sushiya" scene of the classic "Yoshitsune Senbon Zakura". July 1908: Danzô plays at the Kirakuza (Yokohama) the roles of Sadakurô and Hayano Kanpei in the drama "Kanadehon Chûshingura". The role of Okaru, Kanpei's wife is played by Danzô's son Ichikawa Kuzô IV. May 1909: Danzô plays at the Suehiroza (Nagoya) the role of Kômori Yasu in the drama "Yowa Nasake Ukina no Yokogushi". The roles of Yosaburô and Otomi are played by Ichikawa Yaozô VII and Nakamura Shikan V.
July 1909: Danzô plays at the Tôkyôza the role of Matsuômaru in the "Terakoya" scene of the classic "Sugawara Denju Tenarai Kagami". October 1909: Danzô plays at the Tôkyôza the role of Kô no Moronô in the drama "Kanadehon Chûshingura". The role of En'ya Hangan is played by Onoe Baikô VI. November 1909: Danzô plays at the Kabukiza the role of Kô no Moronô in the drama "Kanadehon Chûshingura". The role of En'ya Hangan is played by Sawamura Sôjûrô VII. June 1911: Danzô plays at the Imperial Theater the great role of the king of thieves Ishikawa Goemon in the drama "Sanmon Gosan no Kiri". The role of Mashiba Hisayoshi is played by Onoe Baikô VI. September 1911: Danzô falls seriously ill and dies. His tombstone is located in the Yanaka cemetery in Tôkyô. Ichikawa Danzô VII was an excellent jitsugotoshi and katakiyaku of the Meiji era. His ranking in term of fame was just one rank below the stars Ichikawa Danjûrô IX, Onoe Kikugorô V or Ichikawa Sadanji I.